Dryer Exhaust Systems, require a high temperature blanket specifically designed to provide a one hour fire rating. Dryer Exhaust Systems, require a high temperature blanket specifically designed to provide a one hour fire rating. This flexible, fire protection wrap meets the requirements defined by the Mechanical Code and the Building Code and is an alternative to a traditional fire-rated shaftwall enclosure around ducts. 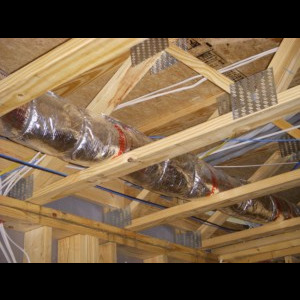 It is used to wrap dryer exhaust ducts to provide critical fire protection and life safety. Unifrax FyreWrap® DPS is a safe and cost effective means to achieve a 1 hour fire-resistance-rated enclosure for routing dryer ductwork through rated wood truss/joist construction. The lightweight core insulation utilizes a ½”, high temperature insulation blanket specifically designed, UL tested & certified to provide a single layer, 1 hour rated flexible enclosure around dryer and residential kitchen exhaust ductwork. The product also provides code compliant fire protection for combustible items, such as plastic pipes by preventing flame propagation and smoke development in the plenum area.